Have you all ever watched an episode or two of that show “Hoarders?” If you have then you already know that what you see on this show is quite unbelievable. Professional psychiatrists and organizers work together on each of the cases to attempt to bring back some kind of order to the chaotic lives of the individuals being profiled. 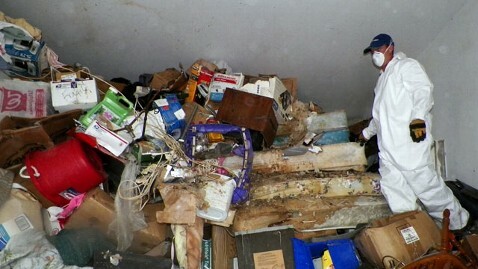 The “hoarders” on this show have homes that are comparable to that of a landfill! The first season that I watched this show, I was dumbfounded as I saw homes covered in animal and even human feces! 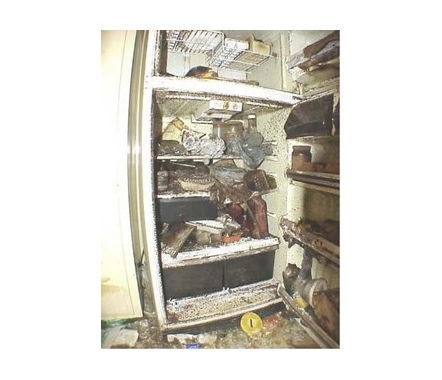 Refrigerators full of food more than a year old, clothing and other artifacts piled up all the way to the ceiling, and roach and rodent infestations are extremely common in these hoarding situations. The different rooms that are typical to a home lose their function altogether. From bathrooms no longer functioning and become storage rooms to kitchens becoming virtual cat litter boxes, these situations are common with compulsive hoarding. I’ve seen situations where dining room tables and even couches were literally hidden beneath piles of junk and hadn’t been seen with the naked eye in years! The truth is that most of these individuals have a real psychological problem. They can find sentimental value in something like a nasty pair of underwear from a loved one who died years ago! Yes, that is how crazy and insane compulsive hoarding can get! In some of the most extreme cases, homes could not be salvaged and had to be torn down. One thing I noticed about these individuals who compulsively hoard is that their problems run very deep. It is the outward expression and the visible “fruit” that makes their issues seem strange, and even hopeless. These individuals are often grieving over losses that have occurred in their lives and many have basically given up on people and life in general. I also believe that fear is also a root cause of this issue as well. Compulsive hoarders will care more about an unsalvageable coffee table covered in rat feces than a loved one. They can attach their affections to things that have no value or that are even unsanitary. It looks absolutely insane to us “normal” folks, but they have adjusted their entire lives around their distorted thinking. Chaos and dysfunction have become their normal. So I have watched this show on and off over the past couple of years, and marveled at this hoarding phenomenon. But as of lately, I believe the Holy Spirit has been speaking to me about spiritual hoarding. In other words, many of our spiritual houses look just like the homes on this show. The various sinful habits that have gone unchecked could be like the feces and various infestations in the home. The lack of proper cleaning and physical damage done to the home is like the erosion of our spiritual houses due to lack of a prayer life and time spent in the Word of God. In many of the cases when they found skeletons of pets they thought had run away and just general stuff from years ago; this is like the many hidden sins and issues that we failed to address over the years. The saying that “Time heals things” is worldly and an outright lie! The issues simply become buried, whether it is under facades or just other issues that may be manifesting at the present time. They don’t go away. We in essence are engaging in spiritual hoarding. Recently, I had a buddy of mine come visit for a few days. As a result, I had to take on the task of getting my other bedroom in order. It serves as my office and I had allowed it to get cluttered. However, I didn’t realize how much stuff I had stashed away until I began to dig deeper. (I hope you see where I’m going with this) I had so much junk mail, work papers and just junk in the closet that I was even surprised. Well to make a long story short, I gradually cleaned the room over the course of a couple of weeks and ended up taking out four large loads of junk on different days. I found stuff from ten years ago and things that I had formally held onto that no longer served a purpose for being in my home. I even found a reminder or two from my sinful past… As I purposed to get this room ready for my guest, I had to be willing to dig deeper and go through all of the stuff that needed to be thrown away. I actually felt like on of those hoarders from the show. As a matter of fact, the music that plays at the end of an episode when they usually get someone’s home cleared was playing in my head once I finished the room! LOL!!! But on a serious note, I realized that in so many ways we are no different from those who compulsively hoard. I know that there are many people in the body of Christ, who are still holding on to past hurts, sinful habits and unforgiveness. Their spiritual houses look just like the ones in the natural that have been subject to physical hoarding. Their spiritual houses are chaotic and don’t function properly due to lack of prayer, lack of faith and a lack of consistent reading of the Bible. Their sinful habits continue to increase the level of filth. So… It sounds like we must get our houses in order. If the Lord is supposed to dwell in our temples, it must be spotless. Otherwise, He will not dwell there because He is holy. As for me, I’m trying to get my “spiritual hoarding” under control. I’ve decided to no longer watch that show with the same JUDGMENT as before. Those who compulsively hoard, have their problems manifest in an extreme way for everyone to see. However, we all know that God looks at the heart and sees EVERYTHING. When I finished cleaning the guest bedroom, the entire atmosphere had changed and there was so much space that opened up. It was a breath of fresh air and almost like a new found freedom. We can have this freedom in our spiritual lives if we are willing to dig into the clutter and began to clear it away. Jesus paid it all so that we can have this freedom in Him. So for now, I’m journeying to find the secret place where I can ascend to a new glory and keep my spiritual house clean.